I love Halloween and decorating for Halloween, in fact I always put up a spooky display piece where I hang ornaments and other Halloween decorations. 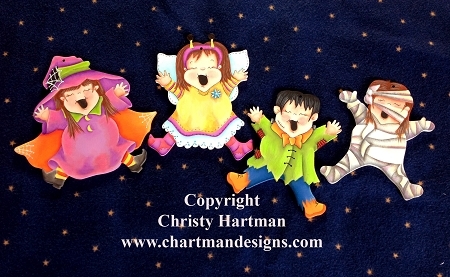 These Halloween Jump for Joy characters will be added to that display piece but could easily be used in so many different ways, attach them to a magnet to be displayed on your refrigerator, attach them to a ribbon and wear as jewelry, attach them to a pin back and wear as a pin, how about enlarging them so they can be painted on a canvas or treat bowl? I think that the potential is tremendous.